Frontline and Frontline Plus are among the most popular topical flea control products. Yet over and over again on discussion boards and in forums, you see comments from dog and cat owners claiming that Frontline isn’t working. Commercial topical products such as Frontline, Advantage, K9 Advantix, and Revolution are, of course, formulated to control fleas. Each of them contains different chemicals, many of which are hazardous. (See the post about dangerous chemicals.) Some of these chemicals may be more effective than others in flea control. A flea is a very resilient creature — difficult to control because it reproduces so rapidly, and difficult to kill because of its bodily structure. Can a flea build up a resistance to chemicals such as fipronil, a key ingredient in Frontline? Quite possibly. Evidence exists that insects can become immune to certain chemicals over time. If you are using a commercial topical product like Frontline, be sure you are following the manufacturer’s application instructions precisely. If you suspect it is not controlling your pet’s fleas, you may, in certain cases, be able to reapply it in as little as two weeks and try again. Speak to your veterinarian about this first. One alternative is to switch to another topical product. Another alternative is to supplement the topical product with another product that works internally, such as Capstar. 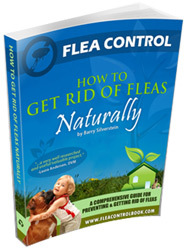 Based on the research conducted for our Flea Control book, however, we believe the best alternative is a natural one. We think it is safer and more effective to switch from commercial products with potentially unsafe chemical ingredients to natural products — products that nature designed to control fleas. For example, using predatory nematodes in your garden is one way to control fleas naturally outside your home. A way to control fleas naturally inside your home is to apply diatomaceous earth or salt to your carpet. A way to control fleas naturally on your pet is to use neem oil. These natural substances have been proven effective for controlling fleas for a long time — longer than the chemicals that are used in most commercial flea control products. The natural substances mentioned here are just a few alternatives to chemical products — you’ll find others in the Flea Control book.